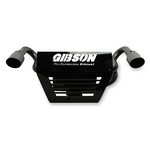 Compliment your Polaris RZR XP Turbo with a Gibson Twin Black Ceramic Rear Exit Exhaust. Get an extra increase of 2-4 rear wheel horsepower, 3-5 more foot pounds of torque. With Gibson's non-packed mufflers you can guarantee a consistent level of sound and performance quality for the duration of your vehicles lifetime.